Today is the first day of a 14-day “fast draft” that several writers and I are doing together. What is fast draft, you ask? The original concept by romance author Candace Havens is a breathless writing pace: 20 pages per day for 14 days, no excuses. By the end, the writer has a complete draft to edit. Why so fast? After all, that’s even more ambitious than National Novel Writing Month (NaNoWriMo), when you write the first draft of a novel in 30 days. Getting the most out of fast drafting requires some advanced planning. Even for pantsers (writers who prefer to write “by the seat of their pants”), an exploration of characters, theme, and plot is needed. No one wants to stare at that blank screen and blinking cursor without some idea of where they are going! 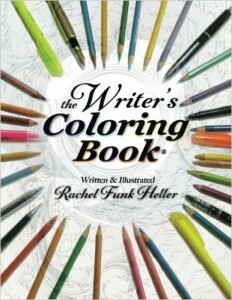 One of my favorite resources for preparing to write the first draft (whether you are doing it quickly or more sedately), is Rachel Funk Heller’s The Writer’s Coloring Book. The workbook helps writers explore the story’s theme, character profiles, and scene dynamics in both analytical and creative ways. Dig out your colored pencils! Another resource I love (I’m a plotter at heart) is Author Jami Gold’s worksheets for writers. These are available in MS Excel and Word, and provide useful ways to structure your story. In addition to writing prep, there are some practical things to plan for in advance, especially if you are the primary meal provider and your family has this thing about not going without food for 14 days (the cat is especially vocal). The crockpot becomes my best friend during this time, along with convenience foods such pre-cooked chicken and pre-cut veggies. Having a supportive family (my guys are great sports) is awesome. I try to get ahead with the laundry and grocery shopping beforehand, but 14 days is a long time, so they pitch in when needed. So, wish us luck! For you readers of the Concordia Wells Mysteries, I am hard at work on book #5 of the series. Somehow, the lady professor always finds a way to get into trouble…. What do a crockpot, a mad bluebird, and Earl Grey have in common? What projects do you have going on that require major planning and support? I’d love to hear from you. P.S. – Be sure to check out the following post for my giveaway and flash fiction fun! Entry deadline is January 31. Go Kathy (and team) go! I’ll be cheering you on. Not sure this approach would work for me, but I’ll certainly think about giving it a go once I’m done with all this horrible editing that I started on an old manuscript. I have a new project just itching to get out, but I’m holding it all inside for now until the editing is done. Discipline or disaster? You tell me. 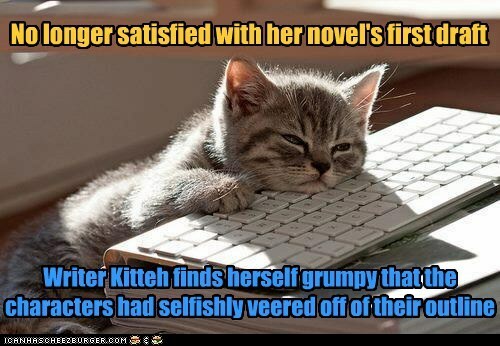 That little defeated kitten laying on the keyboard is so me. Thanks, Patricia! Good luck with editing. Unlike you, Deborah, and Kass, I enjoy editing more than the first draft process, so fast drafting helps. I’m working on rewrites at the moment – seems like an even bigger task than writing the blasted monolith in the first place! But I would like to try fast-drafting in the sweet by-and-by when the monolith is looking good and out of my hair. I love the “kitteh” with the rebellious characters. Mine are always wandering all over the place. Had a great first day of fast-drafting. The support of others is so inspiring! And Deborah, I know exactly what you mean. The edits are often a much taller mountain than spitting out the first draft! 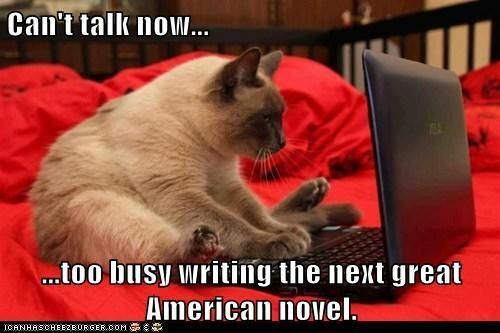 Sometime a kitteh meme makes the point better than anything else. 😉 Good luck with fast draft, Kassandra! Go team! I’m loving this experience. Having you all to be accountable to makes a world of difference! Thanks for the shout out to my beat sheets! I hope they’re helpful for you all. 🙂 Good luck! I love your beat sheets, Jami! Thanks for putting in the time and energy to create them for us.